Located in north-western Belgium, Bruges is one of Europe’s most well-preserved medieval towns, bursting with old world charm Romanesque and Gothic architecture and a romantic atmosphere. Since the year 2000, the historic centre of Bruges has been a UNESCO World Heritage Site and you will see why once you start walking around this beautiful city. Although Bruges is the largest city in the West Flanders province, it is small enough to explore by foot and that is definitely how I suggest you do it. Base yourself in the picture perfect Old Town, surrounded by romantic canals and medieval walls. 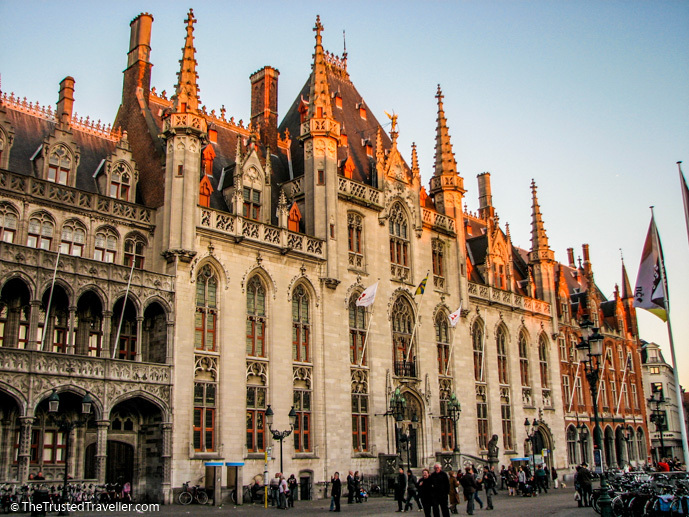 While this is a list of things to do in Bruges, you will discover when you arrive that it’s a place with more to offer than just its major sights. Just wander, eat and take in its atmosphere and I guarantee you’ll fall head over heels for this European gem. 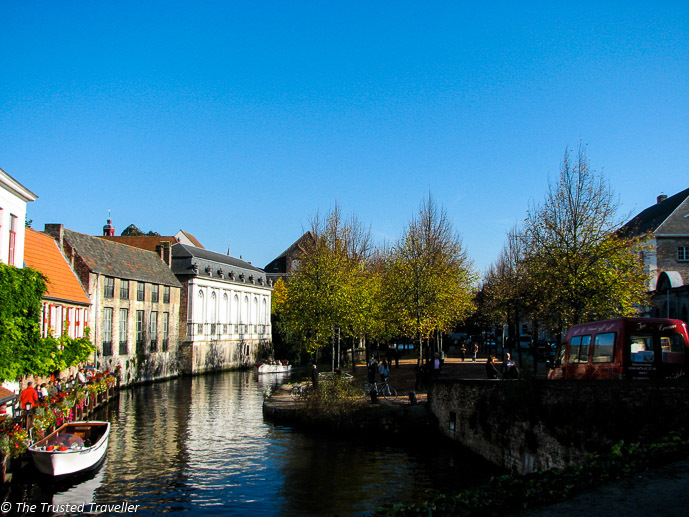 A visit to Bruges isn’t complete without a cruise on the canals. Boarding long narrow canal boats you can enjoy a half hour cruise past some of the loveliest sights in Bruges. An on-board guide will point out highlights and tell you funny little stories along the way. Hours: 9:00-17:00 daily | During Winter on weekends and holidays only. The Markt Square is located roughly in the centre of the old town. This large open square is surrounded by medieval-style buildings and bustling with horse-drawn carriages, restaurants and lots of tourists. On Wednesday mornings you will find a market held in the square. And throughout the year the square hosts other events like opera, plays and celebrations. The square is dominated by the Belfry (more on that further down) and the City Hall, and in the middle is the statue of Jan Breydel and Pieter de Coninck. At the foot of the Belfry make sure to stop for a snack at one of the world-famous chippies, serving fries with mayonnaise. Address: Located in the centre of the Old Town where Steenstraat ends. The Belfry of Bruges is a medieval bell tower dominating the Markt Square and is one of the city’s most prominent symbols. Among some of its original uses, it served as an observation post for spotting fires and other dangers around town. Currently the tower houses a treasure-chamber, an impressive clock mechanism and a carillon with 47 silver toned bells. You can climb the very narrow, steep staircase of 366 steps that leads to the top for incredible views of Bruges and the surrounding countryside. On a clear day you can see for miles. If you’ve seen the movie In Bruges, you will be familiar with the Belfry as it is one of the central features of the film. 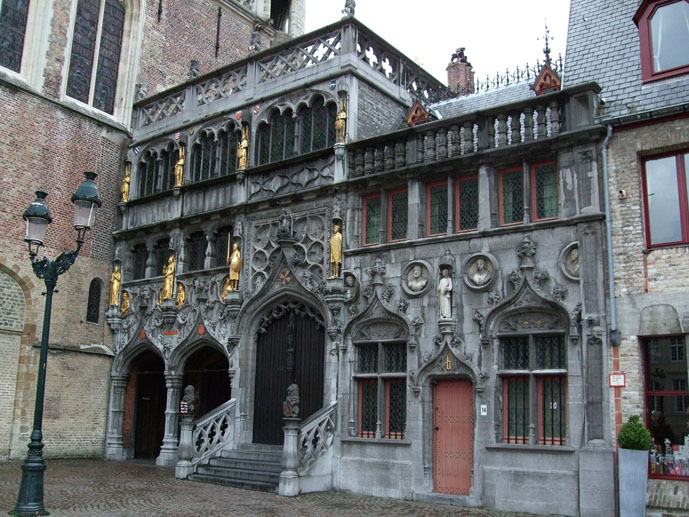 Built in the Middle Ages, the Gothic Church of Our Lady is one of the jewels of Bruges. Its tower of 115.5 meters is the tallest structure in the city and the second tallest brickwork tower in the world. 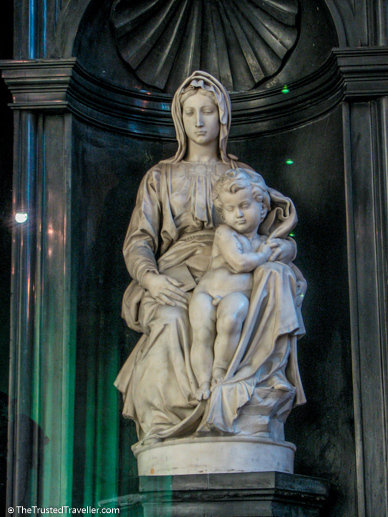 Although the Church itself is beautiful, the main attraction is the white marble sculpture of the Madonna and Child created by Michelangelo around 1504. Being the romantic city that Bruges is, I have to mention some of is most romantic hotspots. Whether you’re visiting with a loved one or on your own, these spots are all beautiful and worth a look when you’re wandering around the city. Minnewaterpark – In this park, located at the southern end of town, you will find a small lake called ‘Minnewater’ or the Lake of Love. The tragic romance of Minna and her warrior love, Stromberg, has evolved into local legend stating that you will experience eternal love if you walk over the lake bridge with your partner. This makes the Lake of Love the most romantic spot in Bruges. 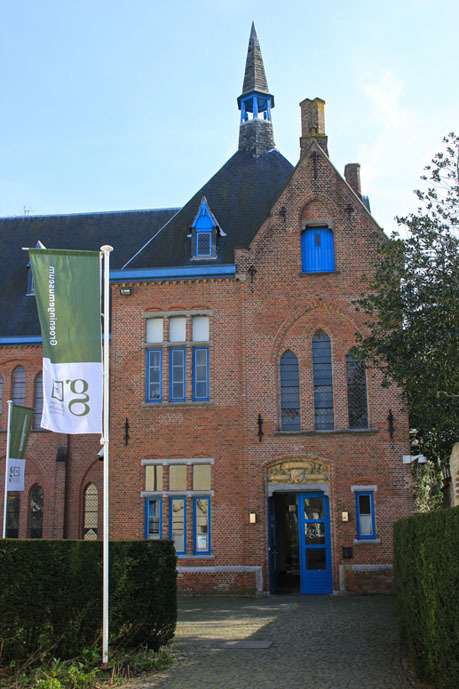 Groene Rei – One of the most beautiful locations in Bruges. Groene Rei offers a varied yet typical Bruges scenery with old bridges and historical buildings framed by a touch of nature. Bonifaciusbridge – Located along one of the picturesque canals, this bridge and area around it creates a romantic atmosphere with its tall trees, hidden benches, and marvelous view on Church of Our Lady and Gruuthuse Palace. Koningin Astridpark – This somewhat secluded park located inside the city, is one of the best place to find quiet and calm in the city. It is the ideal place to relax surrounded by trees and bushes, next to a small lake and colourful kiosk. 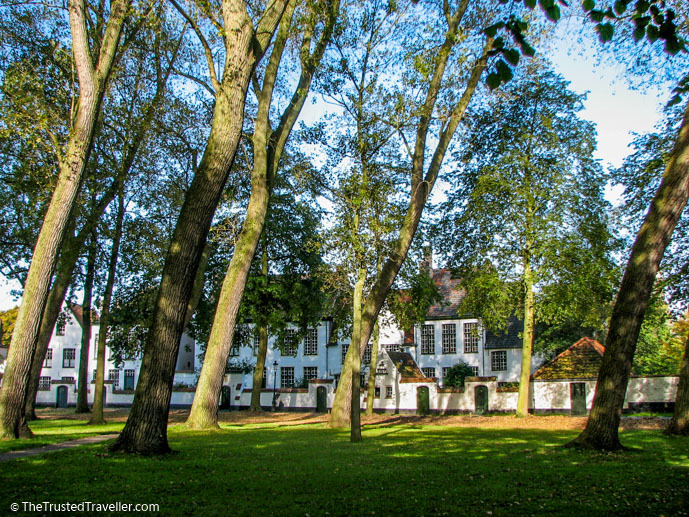 Begijnhof – Inhabited today by the nuns of the Order of Saint Benedict, Begijnhof shows off its whitewashed house fronts, tranquil convent garden and museum founded in 1245. It’s a peaceful and a lovely place to stroll through with a loved one. Head there in spring to see the grassed area dotted with bright yellow daffodils. Rozenhoedkaai – Always making a stunning impression, it is no surprise that this is one of the most photographed spots in Bruges. It’s the perfect place to get the perfect photo while enjoying this beautiful place with a loved one. 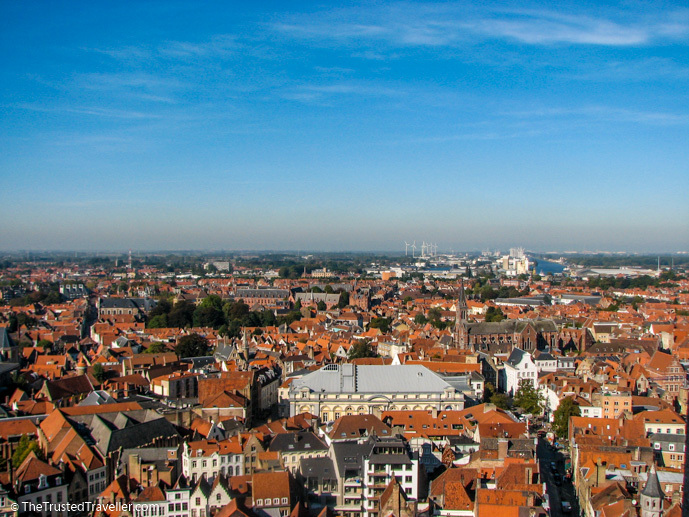 Bruges city ramparts – Away from the centre of town the ramparts are the green lungs that encircle the entire city. Some interesting and romantic locations include the four remaining windmills and the medieval town gates or why not just take a long leisurely walk. Gruuthuse Palace – This beautiful courtyard bordering on the canals has a high wow-factor. The 15th century palace in the shadow of the Church of Our Lady is the perfect spot to give your feet a break by enjoying the scenery from one of the benches. If you’re looking to get a taste of the local art in Bruges then the Groeningemuseum is the perfect place. As one of the most important art collections in Belgium, it displays a near-priceless array of Flemish Primitive, Baroque and Renaissance works along with neoclassical masterpieces of Flemish expressionism and postwar modern art. Who doesn’t love chocolate! Well, in Bruges you’ll find yourself surrounded by the stuff. 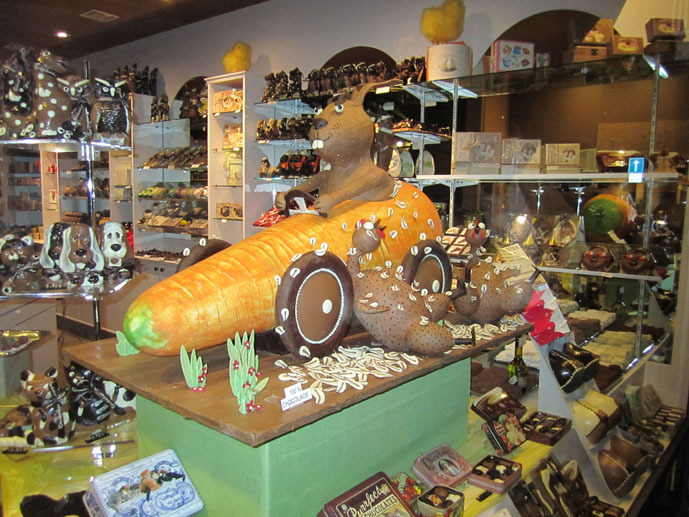 You’ll stumble across dozens of specialty chocolate stores as you wander the old town with amazing displays in the windows that just beckon you to step inside to try and buy. True chocolate diehards can head to Choco-Story, a Museum that tells the story of chocolate. The museum includes lots of interesting info about the history of chocolate as well as regular demonstrations, tastings and recipes. 3 Hour Beer & Chocolate Tasting Tour – taste the best of Belgium in one tour. This small Roman Catholic chapel was original built in the 12th century and claims to possess a vial of the Holy Blood. 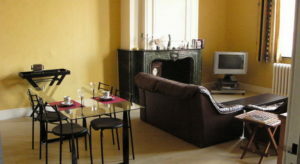 This B&B is housed in a listed building dating back to 1673 in the old town. Rooms are individually themed and comfortably furnished. You’ll find an onsite wine cellar that can be visited for tasting. 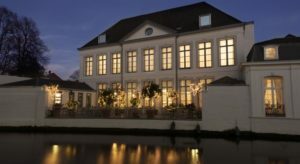 Located in the historical centre of Bruges close to the market square. This baroque guest-house offers bright rooms with a high ceiling and large windows, a private bathroom, free WiFi and a TV. Located minutes walk from the market square, this luxurious hotel offers air-conditioned suites with a spa bath. It features free Wi-Fi and a tea room with a canal-side terrace. 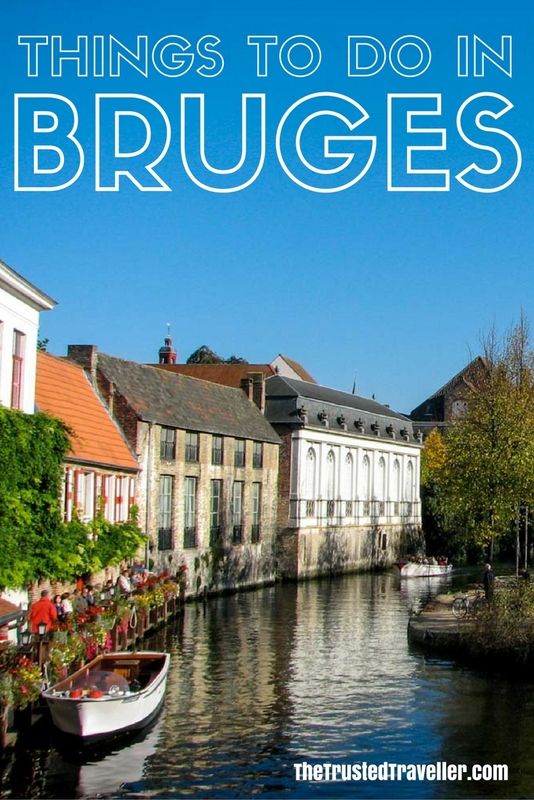 What’s top of your list of things to do in Bruges? Or have you been already, what did you love about it? Thanks for this write up. I really enjoyed my time in Bruges back when I was an exchange student. Lovely small town. That would have been cool being an exchange student in Bruges. Enjoy Tam, it’s a beautiful place. Any recommendations on where to stay to easily get to all the locations on foot? We plan to spend the weekend and there will be 5 of us (3 adults and two children) and we don’t mind sharing one room. Hi Trisha. The place where I stay (Het Wit Beertje) is a small B&B which only has double rooms and may not suit a family. However I’ve just had a quick look on http://airbnb.com are there are some great private apartments and small houses you can rent for a few nights that would be perfect for a family of 5. This would give you plenty of space, seperate bedrooms and the option of having a kitchen to cut food costs. Hope this helps and that you enjoy your time in Bruges. Hi Jen, I loved Bruges, although I was only there for one full day, on a day trip from Ghent where we were based for a while. My favourite place was the Beginhof and I loved the art in the Groeningmuseum! But really, the whole old town was very pretty and just wandering around was great. 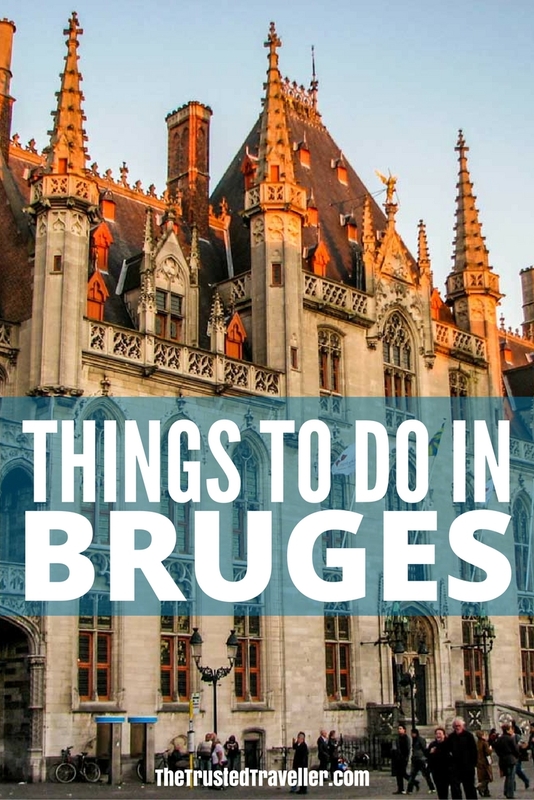 It’s surprising how many things to do in Bruges can be fit into a day – we did all of them on your list except for the canal cruise and the chocolate place (although we went to a delicious chocolate shop and saw inside a few more churches and things). Definitely sounds like you enjoyed your time there Bonny. Your right, it is a very easy place to explore and see and in a short time. My husband and I were there 10 years ago. Now are going back and taking our 3 children with. Our youngest boy who is 6 has a keen interest in various buildings and the material they are made from so I know he will appreciate it. We are staying at a little hotel called Hotel Botaniek. We are very excited. That is so lovely Janine. I really do hope that you and your family enjoy Bruges. It is truly one of Europe’s gems! A great list of recommendations! The canal boats look like so much fun! Thanks for sharing! Hey, it’s great writeup and will definitely help. We are planning for a day trip to bruges and wanted to check how much time it would take to explore the town by walk.